February 14, 2017 (iOS version). 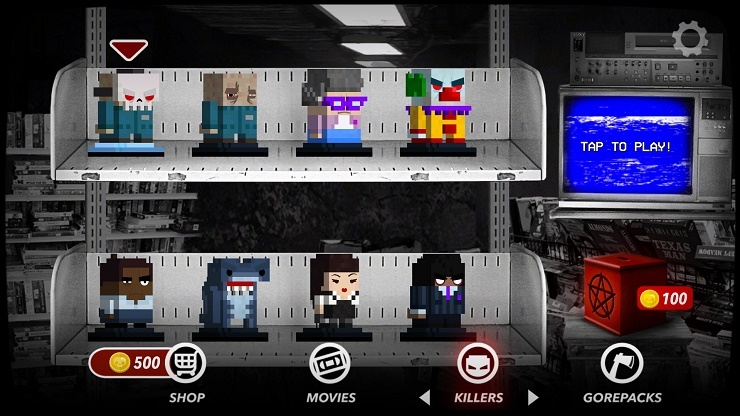 In Slayaway Camp you are a Myers/Jason-esque murder machine who must navigate a checkerboard style map to slaughter unwitting victims and then head to the exit, much like a violent version of those sliding block puzzles from the Skylanders games. Directing your silent killer directly onto a victim sees your blocky murderer dispatch their prey in a number of inventive ways, while landing next to them sees them run away, you’ll need to pay attention to the layout to ensure that you guide them to the correct positions to facilitate your escape after. Littering the environments are a series of hazards which you and your victims can fall prey to. Holes, fires, mines and electric fences can be used to facilitate the killing while understanding how to guide yourself around cops, SWAT members and cats is essential to pass; the layouts are designed precisely to give you ways to trip yourself and you’ll often miss something that’ll result in you biting the big one rather than a victim. Ninety-nine percent of the time there’s only one solution to the puzzle at hand, so there’ll be a lot of times where you’ll kill all your targets or leave only one and not be able to find your way to them or the exit; thankfully the game is equipped with a rewind function to allow you to skip back one, several or all turns so you can quickly attempt the slaughter again. The game is filled with a number of horror tropes played on for comic value; there’s a summer camp, a beach, an amusement park, and a space station to name but a few and each one is introduced with a grainy found footage style trailer for a film. New killers are introduced with each feature as well, and extra ones can be purchased with in-game currency as can ‘gorepacks’ which are new death scenes for your victims, each accompanied by a cacophony of ear-splitting shrieks and wails. With the abundance of hazards mentioned earlier, things can – and more often than not, do go wrong, hence the nifty rewind feature; while some of the elements can make it easy to spot the route to follow some of the more advanced tricks used to shepherd people into the right positions aren’t quite so clear. Here Blue Wizard has a two-step hint system (bought with in-game currency) to help ease frustration. The hints cost twenty-five coins and generally offer up obvious snippets of advice leaving you feeling like you just wasted your time, after this the game offers you a level walkthrough for a hundred coins; it’s expensive as it’s obviously supposed to put you off using it and figure the solution out yourself, but I have to wonder why it jumps straight from hint one to a level walkthrough and not offer a second stage hint for fifty coins in between, which would probably have worked out a lot better. In-game currency is both plentiful and sparse, sounds weird I know. Each level ends with a bonus kill where you need to stop a marker in a zone to watch a special murder, success earns you a rather meagre amount of coins, hence plentiful but sparse. With a whole raft of things to purchase with the money, you can find yourself struggling for funds; as a result there’s an extra mode where you do nothing but these bonus kills over and over with an ever more difficult target to hit. The more success you have the more coins you will earn. 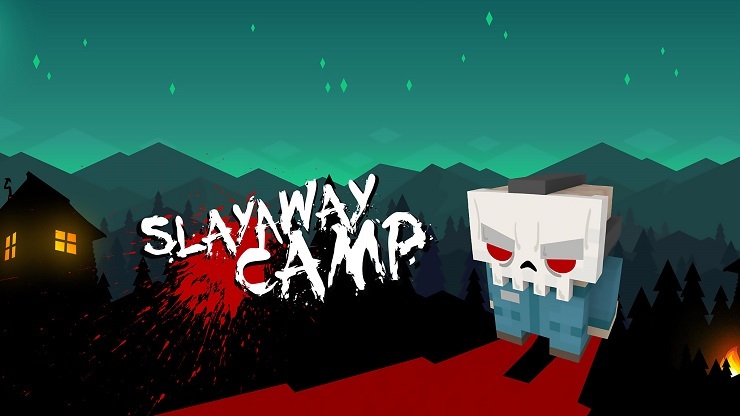 There’s no denying that Slayaway Camp is a loving send up of horror, from the little references to the trailers to the music, Blue Wizard display a considerable amount of affection for the genre; it’s just a shame that there’s only a certain amount of times and ways you can watch little blocky humans get murdered before the shtick starts to wear a little thin. The puzzling itself is great, with some rather ingenious layouts to navigate and only let down by a hint system that is both too vague and overly generous with helping you to find the solution. 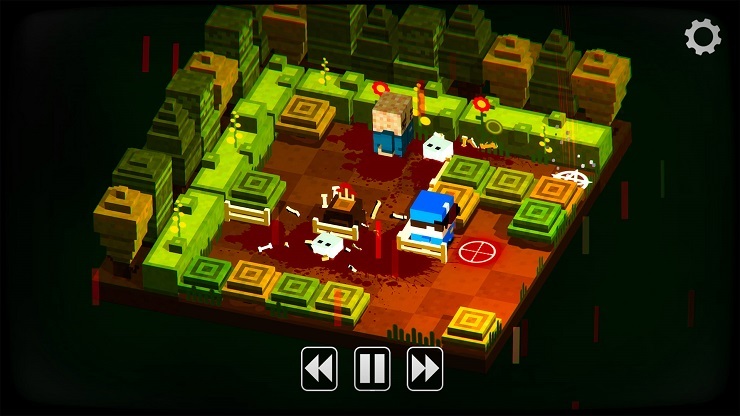 An inventive take on the sliding block puzzle genre, it all just depends on how quickly you get tired of slaughter.